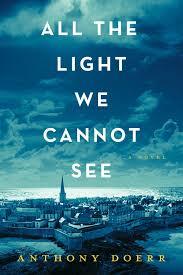 Anthony Doerr’s novel All The Light We Cannot See is worthy of its New York Times Best Seller status. This wonderfully written book , like The Book Thief, tells a story unfolding during World War II, primarily through the eyes of children. Set in France and Germany, a blind girl raised by her locksmith father is brought into the middle of a search for a fabulous jewel. The jewel is removed from the museum where her father works to keep it from the occupying Germans. Meanwhile a young German boy growing up in an orphanage with his sister is co-opted by Hitler Youth because of his demonstrated skills in working with radio receivers. Lives intersect during the search for the missing jewel and for the location of a hidden French Resistance radio transmitter, located where else but in the attic of the young girls uncle’s home in Brittany where she has fled from the German occupation of Paris. Doerr’s organization of the novel is pleasing to the reader. The chapter construction splendidly carries the story line filled with suspense, intrigue, the realities of war and wonderfully portrays the love between a father and daughter. The book moves very quickly but the reader never feels pushed or rushed. I highly recommend All The Light We Cannot See, a very good read for teenagers and adults. I would predict that it will be among the best novels of 2014. Anthony Doerr is the author of the story collections Memory Wall and The Shell Collector and the memoir Four Seasons In Rome. 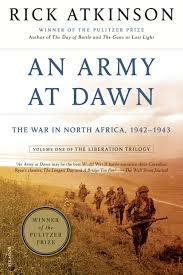 Rick Atkinson’s first volume of his World War II Trilogy An Army At Dawn is an extraordinarily candid appraisal of the performance of the U.S. Military during its initial foray into the Second World War in North Africa. This excellent historical work portrays the North Africa Campaign of 1942-1943 as a painful dress rehearsal for a green U.S. Command and Army, embarking on its first and often catastrophic combat missions since the First World War. ” A great sorting out was underway: the competent from the incompetent, the courageous from the fearful, the lucky from the unlucky.” Atkinson spares no one in his harsh analysis of both the American and British forces and their leadership. The takeaway is that if the Allies had invaded across the channel in 1942 as originally envisioned, D-Day would have been a disaster only rivaled by Dunkirk. A move up the boot of Italy or into southern France according to Atkinson’s read would have also been doomed from the outset. The North Africa Campaign learning curve was critical to the final Allied victory in Europe. ” Eisenhower had been naive, sycophantic, unsure of his judgement, insufficiently vigorous and more a titular than actual commander.” Atkinson is blunt in his appraisal that North Africa taught the American Infantryman the necessity of ” ruthless killer instinct” in battle.” ” A soldier is not effective until he has learned to hate. When he lives for one thing, to kill the enemy, he becomes of value. ” The collaboration in the North Africa Campaign with the British under Montgomery foretold difficulties to come in the invasion of Europe. Eisenhower, Patton, Bradley, Montgomery, Rommel, all portrayed by historian Atkinson at their very worst and very best. The book is scholarly in its approach and yet very readable, filled with humanity, heroism, and battlefield reality. After months of failure with enormous and often needless casualties, American forces finally morphed into fighting form and marched through the Kasserine Pass and on to the sea at Tunis. An Army at Dawn was written in 2002. The remaining volumes in Atkinson’s trilogy are The Day of Battle, the war in Sicily and Italy ( 2007 ), from 1943-1944 and The Guns at Last Light, (2012), the war in Western Europe, 1944-1945. Atkinson also authored The Long Grey Line and Crusade.